Even as we continue our research for defining an actionable roadmap the confidence of CIO’s in BI has shifted due to the lack of a proper methodology. The BI confidence is once again back to its August 2008 mark= #5. 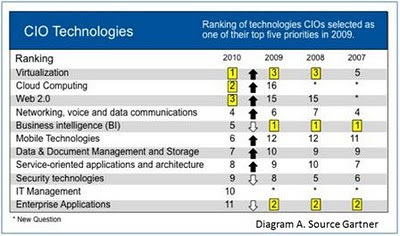 It was a brief trough but maybe a glimpse of things to come but no one had listened..
After the release of this priority we spoke to fourteen CIO’s with a question ‘Does this indicate that for 2010 reports and analytics are not an important priority for IT?. 3. While technology is thundering at ‘full-speed-ahead’ CIO’s of small, medium and big companies are worried that no one seems to be concerned with resolving the core issues of the matter – that only 55% of BI implementations succeed, and what if the endemic issue is actually worse than that. There is a universal feeling that there is lack commitment, or a lack of a reliable / proven roadmap, from the triad partners (SW, HW and Implementing partners), i.e. a clear roadmap that is consistent, reliable and assured to meet business expectations. Opinion: I must include that this comment may be biased due to my BI background however it deserves a passing thought. From a BVA, Business Value Attainment analysis ‘virtualization’ and ‘cloud computing’ are new concepts with unclear BVA deliverables as of yet. Clouds and virtual wares simply add more servers for delivering the same services and apply extremely well in very large, unpredictable, data and access scenarios like Facebook, Google, Yahoo, Twitter. However, its relevance in a business background is still unfounded. Both VM wares and clouds allow automatic server re-assignments and works well with companies with a few Exabyte’s of distributed requirements where sharing, usage or consumptions remain highly unpredictable, i.e. an accident in the Winter Olympics can spike system access from a few million to a few billion within minutes. In such a situation the VM servers in Sao Paolo or Istanbul, or Mumbai, or Singapore, or taiwan, etc.. will automatically start picking the excess loads of US and Europe transparently without the North American service crashing. In 99% of the enterprise environments performance and concurrent users are highly predictable attributes. Business Case: I have been recently informed of a BI implementation in Asia that is moving from their standard BI production servers to VM ware. Due to VM being a nascent technology in ERP BI, the VM vendors have recommended the company move from a current 4 server cluster to a 32 server cluster. They have also added that due to the nascent concept of VM ware on PROD the customer must keep all the 32 servers dedicated to BI only. This recommendation defeats the fundamentals of VM and cloud computing, but I will not try to figure this one out. I bring this up as - according to the principles of BVA we must first define the Business Value see how an investment improves our product or services. We can only wait and see. These responses lead us to assume that taking BI from its #1 priority to #5 is both logical and possibly a temporary hesitation as CIO’s find more resistance to invest into risky methodologies that are not assured to meet business expectations. There are two keys to this issue. If the foundations are weak then no amount of technology can resolve the issues.